Hanoi (VNA) – Vietnam and Hanoi in particular always value promoting ties with ASEAN member states, including Thailand, Permanent Vice Chairman of the Hanoi municipal People’s Council Nguyen Ngoc Tuan told Vice Chairman of the Bangkok Metropolitan Council Nirunde Praditkul during a reception in Hanoi on August 10. Apart from bolstering ties between the two cities, Tuan expressed his wish that Bangkok would increase the sharing of its experience in State management, urban issues and investment, among others, with Hanoi. Praditkul, for his part, said Thailand is paying attention to developing transport connectivity with the ASEAN member states and China to facilitate travelling and trade, adding that Thailand plans to expand road connecting Bangkok with Laos and Vietnam. 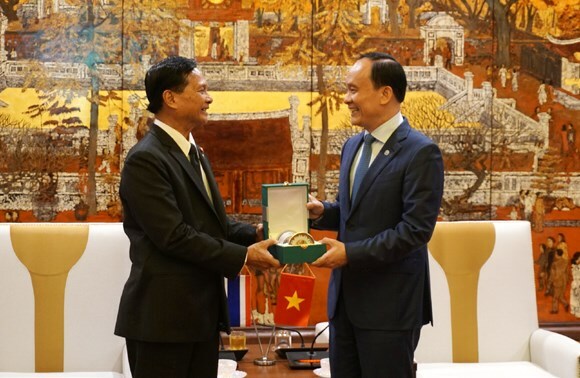 Tuan said enhancing regional transport connectivity also matches the goal of developing tourism in Hanoi.